We spoke with Lisa Clark, an Italian pacifist with a great track record, among many other things co-president of the International Peace Bureau; we interviewed her as Italian coordinator for Mayors for Peace, one of the international organizations that are a part of ICAN. 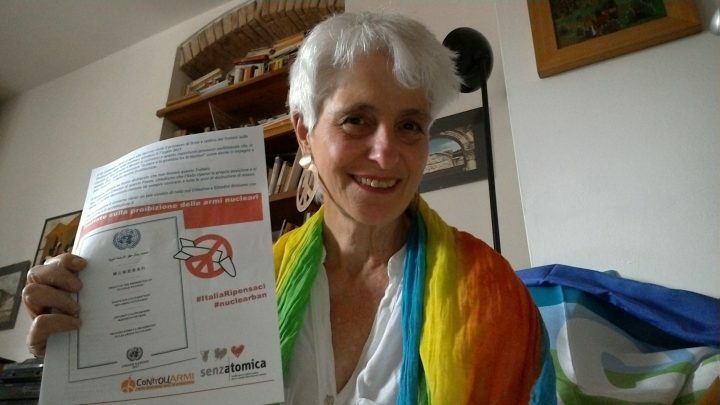 As Pressenza is also in ICAN, we are therefore talking among colleagues in the same international campaign to ban nuclear weapons, although each of our organizations has a specific focus. Could you give us an overview of the international and Italian situation of Mayors for Peace with the latest news. At an international level, Mayors for Peace (MfP) supported ICAN activities with two major appeals written by the Mayor of Hiroshima, MfP President, to more than 7,000 members, inviting them to make cities’ voices heard to encourage national governments to participate in the treaty process. Mayors Matsui and Taue attended the two sessions of the Conference of States at which the text of the Treaty on the Prohibition of Nuclear Weapons was discussed: they expressed, with all the authority that comes from being the elected representatives of the two cities destroyed by atomic bombs, their full support for those who fought for the prohibition of nuclear weapons. Together with the Hibakusha, the bomb survivors, they convinced many delegations of the need to vote for humanity, not for diplomatic expediency. Mayors for Peace contributes actively to the campaign “Italy Think Again!”, promoted by Rete Disarmo e Senzatomica, for Italy to sign the Treaty on the Prohibition of Nuclear Weapons: How has the campaign gone so far? What events have affected you most? In Italy, we have now reached 500 members. I began to commit myself to promoting MfP in 2005, on the occasion of the events we organized in Veneto and Friuli Venezia Giulia for the 60th anniversary of the 1945 bombing. And I remember that in those years municipal administrations had much more energy to deal with international issues: Florence was vice-president of MfP. With the hospitality of Mayor Domenici and the President of the Municipal Council, Eros Cruccolini, an assembly of Italian members was held at the Salone dei Cinquecento, to which the mayors of Ghedi and Aviano, the two cities still home to U. S. nuclear weapons, were invited. On behalf of all MfP members, Florence signed a friendship pact with Mayors Annamaria Guarneri (Ghedi) and Stefano Dal Cont Bernard (Aviano), with the aim of working together to remove nuclear weapons from the bases in those two territories: a step towards the total elimination of all nuclear weapons. We were very active. And every year we have organized events to mark the anniversary of Hiroshima and Nagasaki (August 6-9): the Peace on Bicycle event, which always ends in front of the USAF base in Aviano on August 9, also aims to gather new members for MfP: in 13 years we have almost tripled in number! In the framework of the MfP campaign, you lobbied particularly for motions to be presented from below at all municipal councils inviting the government to sign: How’s it going? Can you give us figures? Yes, in Italy we have come a long way in approving the advisory motions. This is the country of Giorgio La Pira: and when I told Mayor Akiba (Mayor of Hiroshima until 2011) he replied:”But La Pira was the prophet of Mayors for Peace! La Pira claimed the right of cities to international politics, friendship and collaboration with other cities beyond the borders of states. He invited the mayors of some fifty capitals to Palazzo Vecchio, in the middle of the Cold War: sitting next to each other, the mayors of Washington, Moscow, Prague and London demonstrated that they had a different vision of their national governments. La Pira, who was devastated by the massacres of Hiroshima and Nagasaki, wrote that no one has the right to kill a city, and yet history shows us that cities remain, while states come and go. And Mayor Akiba liked to say that a city knows how to solve problems without resorting to weapons, that cities do not have armies. For all these reasons, we believe that the voices of local councils is important. To date, only a few municipalities have adopted a specific resolution calling on the Italian Government to “think again” and accede to the Treaty on the Prohibition of Nuclear Weapons. But the second phase of “Italy Think Again”, from February to July 7, 2018, will push an avalanche of motions from local authorities to be handed over to the new government.